11/14/07, The Artists' Quarter: We're celebrating Jazz Police chief Don Berryman's birthday. After hearing Dean Granros at Cafe Maude (sort of; loud crowd) over dinner, we head to the AQ for Valves Meet Slide, a quintet with not one but two trombones. 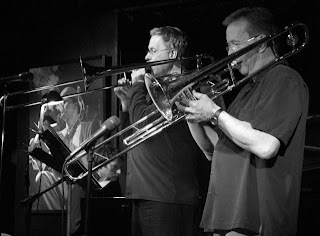 Valve trombonist Brad Bellows and trombonist Dave Graf front Peter Schimke on piano, Gordy Johnson on bass, and Mac Santiago on drums. It's cold outside, warm inside the homey AQ, one of my favorite places on the planet, where the size of the audience (small tonight) never seems to have a negative effect on the performance. Music as fine as you're likely to hear anywhere is a regular thing at the AQ. See Valves Meet Slide on youtube. Photo: L to R: Dexter Gordon (the famous AQ poster), Peter, Dave, Brad.